This past Friday my second shipment from the G.I. Joe Club’s 4th Figure Subscription Service (FSS) arrived in the mail. It contained the Night Creeper Ice Ninja and Barricade. First up I’m going to take a look at Barricade. When the FSS line-up is announced each year there are always some figures that I’m really excited about and others that I’m lukewarm on. My lack of excitement for a particular figure may stem from me having no personal attachment to the character, or because I don’t like the way the toy looks, or because it just feels redundant; like a Cobra Bat in yet another color variation. Barricade was one of those lukewarm figures for me this year. Fortunately, for the past three years, I have always found myself pleasantly surprised once I got those lukewarm FSS figures in my hands. Previous figures that I expected to dislike, like Alpine or Airtight, won me over in the end. Go back through my FSS figure reviews and I don’t think you’ll find a negative one. Well that’s about to change because Barricade is a turd of a figure. 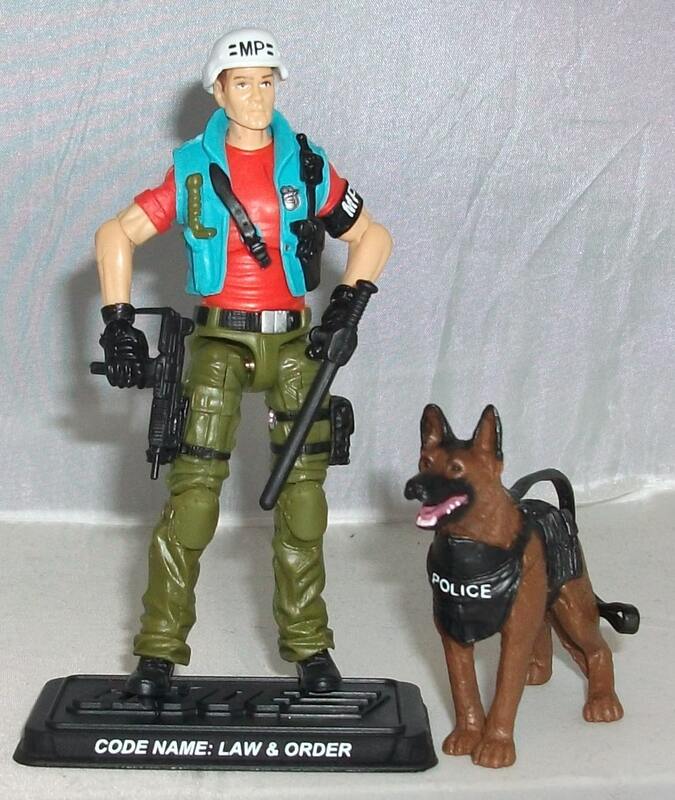 The original Barricade figure was released in 1992 which was after I had quit collecting Joes as a kid. 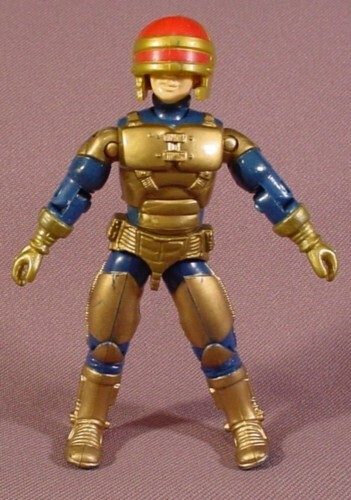 He had a science-fictiony, Robo-Cop-esque look to him courtesy of his gold plated body armor and helmet with a red Visor akin to Cyclops of the X-Men. Underneath the helmet was a rather nerdy face with a side part in the hair. He was the Joe team’s “Bunker Buster” and it was the 90s (the era of over-sized spring-loaded weapons) so he came packaged with a massive missile launcher that no real person would ever be able to carry. 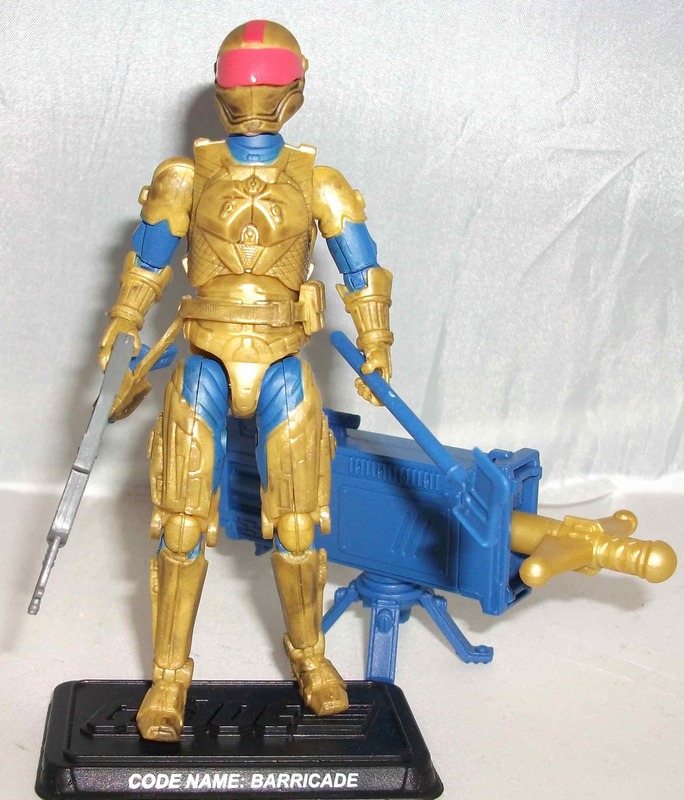 Repaints of the original figure were released in 1993 and 2004. I have never owned any of those three Barricade figures so I have zero attachment to the character. 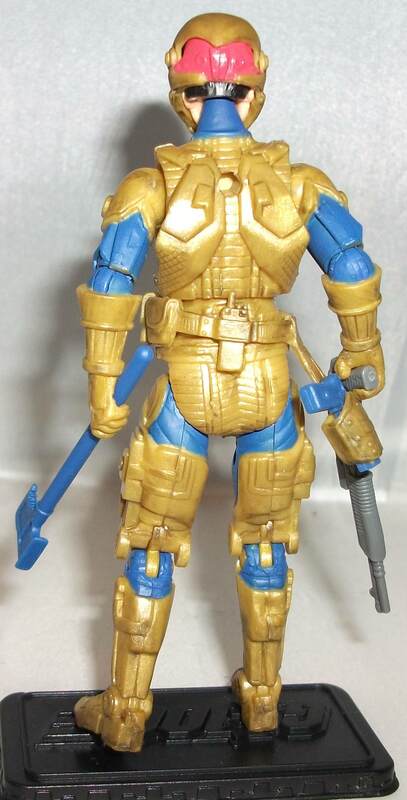 That is partly why Barricade was one of the characters I was least excited about when the FSS 4.0 line-up was announced at last year’s Joe Con. However, he was a character who hadn’t yet received a modern-era figure and I’m always happy to add unique characters to my collection even those I didn’t grow up with. I was hopeful that the Club would surprise me with an impressive figure. Unfortunately, my lukewarm thoughts only got warmer (cooler? luker?) when the first mock-up images of the figure were shown a few weeks after the initial announcement. I did not care for the parts chosen to construct him. 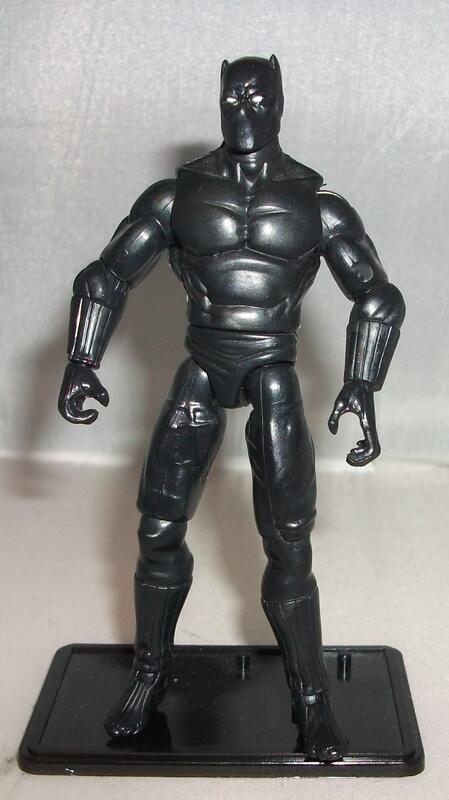 He was a blend of armored Cobra Commander arms on an Accelerator suit body from the Rise of Cobra toyline. The parts didn’t appear to come together very well and the helmet seemed to sit awkwardly on whatever head they used. Poor construction was strike number two against Barricade yet I tried to remain hopeful that the final product would be better than the photoshopped mock-up. Well now I have him in hand and I can tell you that Barricade is even worse than I feared. 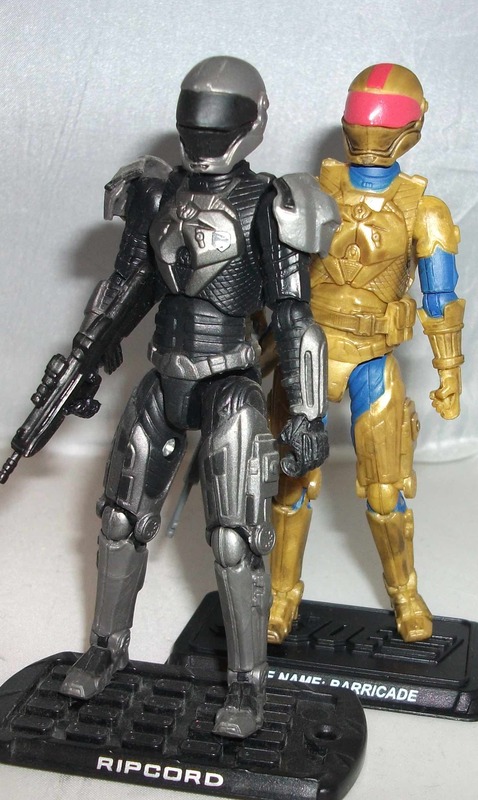 The accelerator suit body (which I don’t love anyway) looks really weird with the Cobra Commander arms. The arms are just short enough to make it look like he’s got some sort of growth defect, like he’s a dwarf or a T-Rex or something. The helmet sits just as awkwardly as it appeared to in the promotional image and now I know why. The head they used is too damn big. Up until I opened this figure I had no idea what the head would look like. The Club hadn’t given us any hints as to what was under the helmet. It could have been a brand new head for all I knew which would have been a nice surprise. Even though the original Barricade head was pretty dorky looking I would’ve loved to discover a newly sculpted version of it, side-part and all, hidden underneath the ill-fitting accelerator suit helmet. 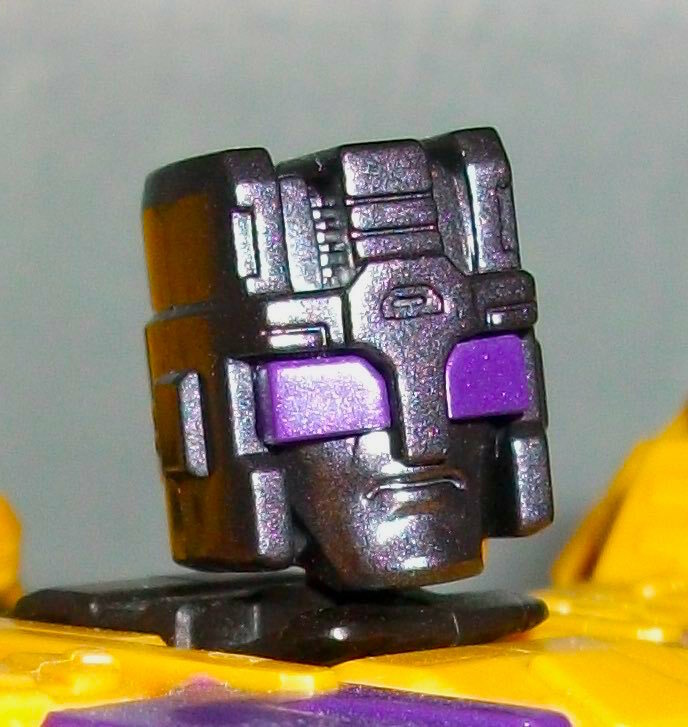 Instead we got a repainted Chuckles head. I’ve previously ranted about how much I dislike this head in my reviews of Chuckles v.3 and Chuckles v.5. It’s an ugly misshapen head with big hair and a pervy expression it needs to remain covered up. The other major thing that really drags this figure down is the paint job. I actually liked the shimmery metallic gold shown in the mock-up image but sadly the actual figure is completely devoid of shimmer. The armor is a flat rust color with a faint marbleization effect. It’s ugly and there is a lot of it. There isn’t enough blue to break it up. The original Barricade armor was simple and blocky and didn’t allow for much painted detail. This modern paint job may echo the original but the accelerator suit is so much more intricate than the original armor and its begging for additional paint apps. Some red or black highlights would’ve helped this figure immensely. Barricade’s accessories are okay. He has a machine gun, a shotgun, a pistol that can be holstered on his leg, an axe, and a spring-loaded cannon with a tripod. The Cyclops/Robo-Cop helmet should’ve been Barricade’s signature piece and I really wish the Club had splurged to craft a new one. The accelerator suit helmet is a weak substitution. The lopsided red visor is especially ugly. It probably would’ve looked better had they used translucent plastic. There’s no debating it. This is a fugly figure in both build and color. It is the worst figure the Club has produced since their horrible Iceberg of 2013. A massive disappointment. 3 out 10. For the past year or so Hasbro has focused their G1 Transformers toyline on the ”Combiner Wars” theme. Combiners, for those of you who may not know, are the big Transformers that are created when you combine a bunch of smaller ones. There were many combiners in the vintage toyline but for some reason Hasbro had shied away from including them in their modern Transformers toylines until now. Since launching the Combiner Wars concept last year they’re released updated versions of the Aerialbots who form Superion, the Stunticons who form Menasor, the Constructicons who form Devestator, and the Protectobots who form Defensor. In addition to all of those remakes of vintage combiner teams Hasbro has also created brand new combiners made up of fan favorite characters who hadn’t previously been combiner components like Optimus Prime and Hound. It’s a good time but an expensive time to be a Transformers collector. I haven’t bothered collecting any of the newly created teams, because I already have modern-era, but pre-Combiner Wars versions of Optimus, Hound and the others, but I have purchased the new CW versions of Superion, Menasor, Devestator, and Defensor. 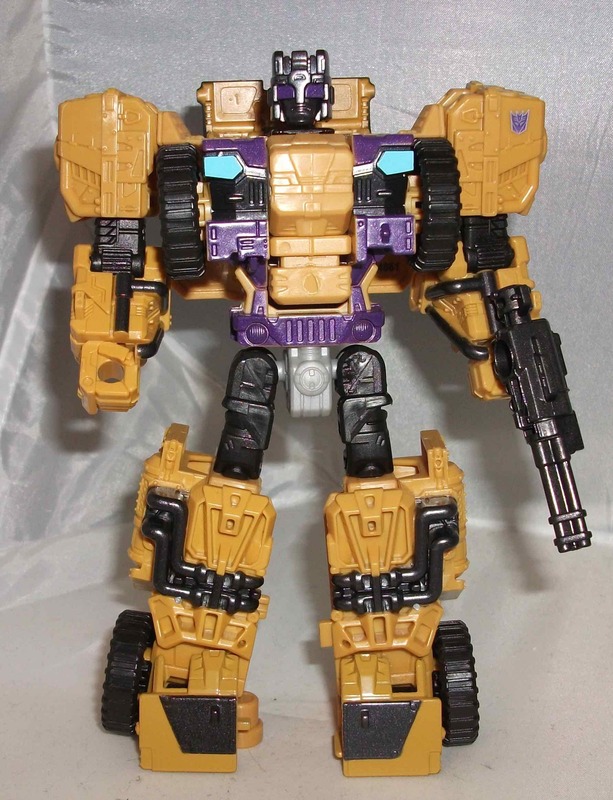 The latest vintage combiner team to get a Combiner Wars makeover is the Combaticons who form Bruticus. Bruticus is one of the coolest combiners (with a name like that how could he not be?) but I honestly didn’t know if I would bother buying the CW versions of those characters. The reason being that Bruticus was the rare exception to the no combiners rule seemingly instituted by Hasbro for the past 10 years. A modern Bruticus figure was released as part of 2012’s “Fall of Cybertron” toyline which was based on the Ps3/XBox 360 game of the same name. Vanessa got me all 5 Combaticons for Christmas that year and Bruticus has been looming over the rest of my puny Transformers ever since. I really didn’t need two Bruticuses (Brutici?) on my shelf where space is already an issue. However, the thing about Combiners is that while the fully combined giants are really cool the smaller robots that make them up are sometimes really cool too. For example, First Aid is one of my favorite Transformers characters. I couldn’t bear to display him as simply Defensor’s leg so I swapped him out for one of the Stunticons so I could display him on his own. 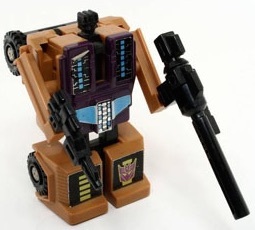 Swindle is another awesome character who is so much more than just a limb. I actually considered buying two of the 2012 Swindle so I could display one as an individual while still having a complete Bruticus on display. 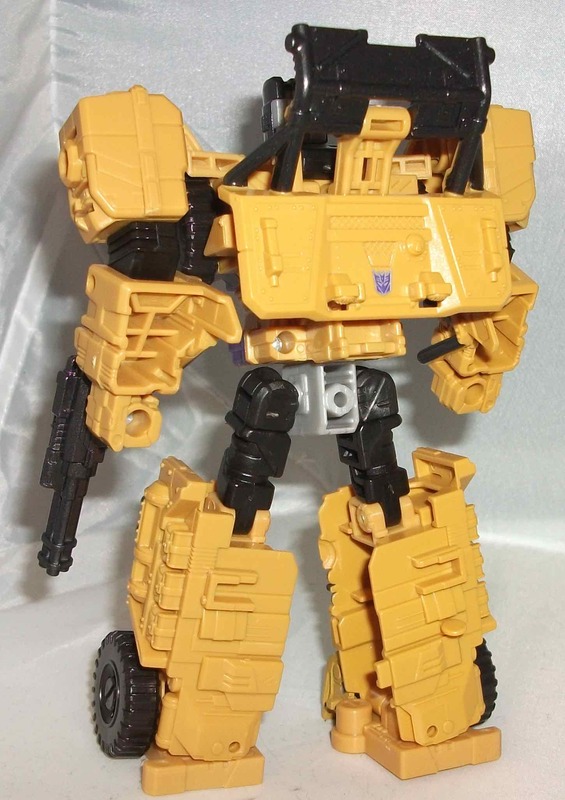 I didn’t end up doing that so my collection has essentially been Swindle-less since I opted to display my lone 2012 Swindle in leg mode. 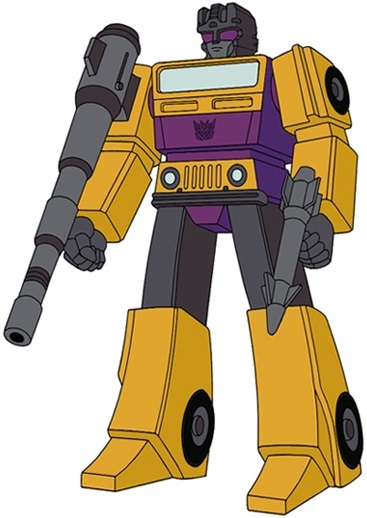 The release of the Combiner Wars Combaticons presented me with the opportunity to buy a new Swindle figure that could finally be displayed as an individual character. He likely would’ve been the only CW Combaticon I bought had I found them at regular price but Toys R Us had them on for half price over Christmas so I bought all four of the limb characters; Swindle, Brawn, Blast Off, and Vortex. This Swindle figure is a re-tooled and re-painted version of the Protectobot, Rook that was released a few months earlier. 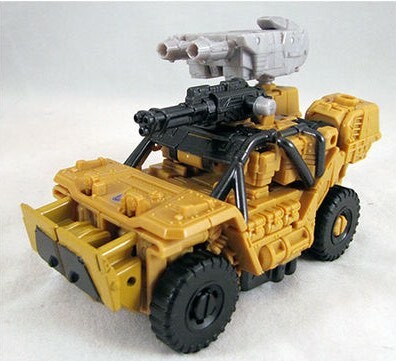 Obviously I’d prefer it if all Transformers had their own unique sculpts but this body works quite well for Swindle and it’s different enough from Rook, especially in vehicle mode, that it doesn’t look like a complete clone. In fact I think this is probably the best Swindle figure to date despite the fact that it’s modified version of another character. The 1986 original was a boxy turd of a figure and the 2012 version was too flimsy and too science fiction in design. This figure is sturdy, it’s relatively cartoon accurate, and it’s got plenty of articulation. My favourite thing about this figure is the newly designed head. It looks exactly as it should. The shape is right and it has those big purple sunglass lense-like eyes that are his trademark. This is a cool figure and I’m glad to finally see this conniving, double-crossing, greedy con man get his due. 9 out of 10. 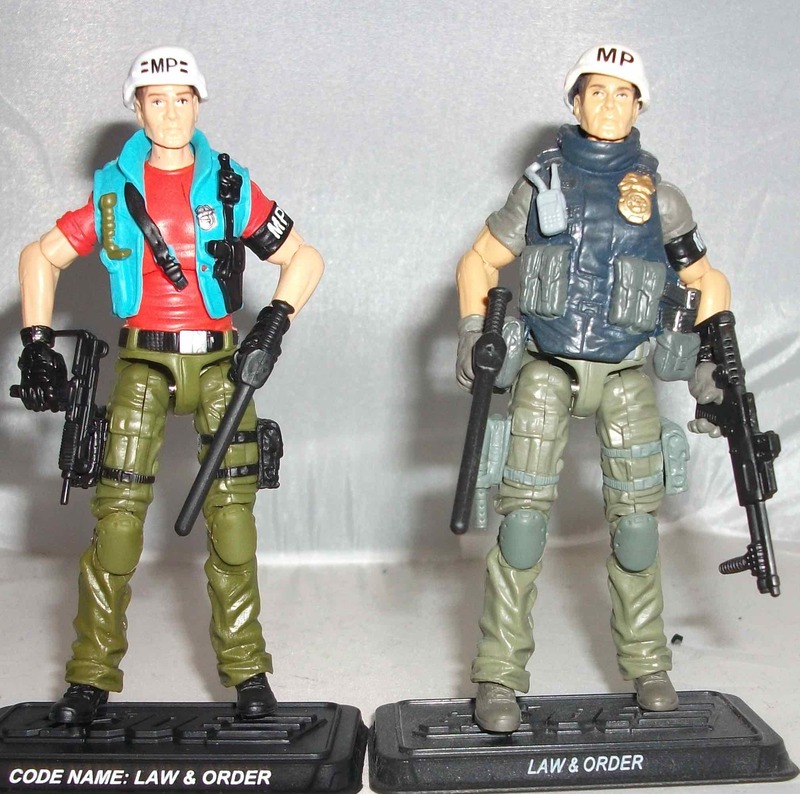 Last week I reviewed Law & Order, one of the first two figures to ship out as part of the G.I. Joe Collector Club’s FSS 4.0. Today I’m going to take a look at the other one, Nunchuk. The original Nunchuk figure was released in 1992 which was two years after I had quit collecting G.I. Joes as a kid. I lost interest in the brand for a number of reasons and the influx of ninjas didn’t help matters. Now I liked ninjas as much as the next guy, I was into TMNT and I watched the American Ninja movies, but I didn’t like them overtaking G.I. Joe. Snake Eyes and Storm Shadow were cool; one ninja on each team of soldiers was fine. But then they added Jinx and the Night Creepers and then Firefly and Zartan were ninjas all of the sudden and then came Ninja Force. 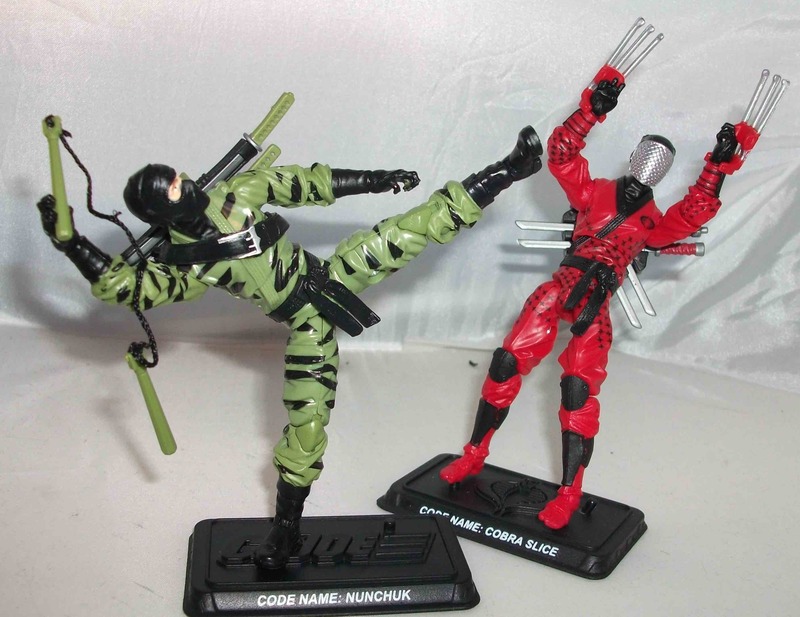 Ninja Force was a sub-team of Joes and Cobras consisting of Nunchuk, Bushido, T’Jbang and Dojo on the good side and Slice, Dice, and Banzai on the evil side. My little brother Brain was into Ninja Force but they didn’t do anything for me. In my mind they just watered down G.I. Joe’s military theme. 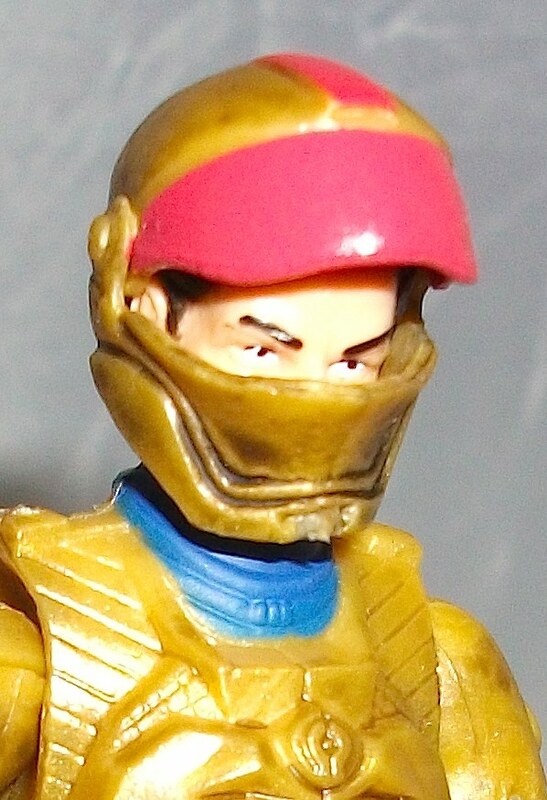 I’m pretty sure Brian owned the original Nunchuk figure but I inherited Brian’s Joes and I don’t have Nunchuk now so god knows where he ended up. For some reason my dislike of 90s G.I. Joes has tapered off as I’ve gotten older. I don’t have nostalgic ties to them like I do with the 80s figures but there were some cool character designs during the final years of the Real American Hero line that I didn’t appreciate at the time. Nowadays I’m actually excited to add updated versions of those neon 90s Joes to my modern collection. 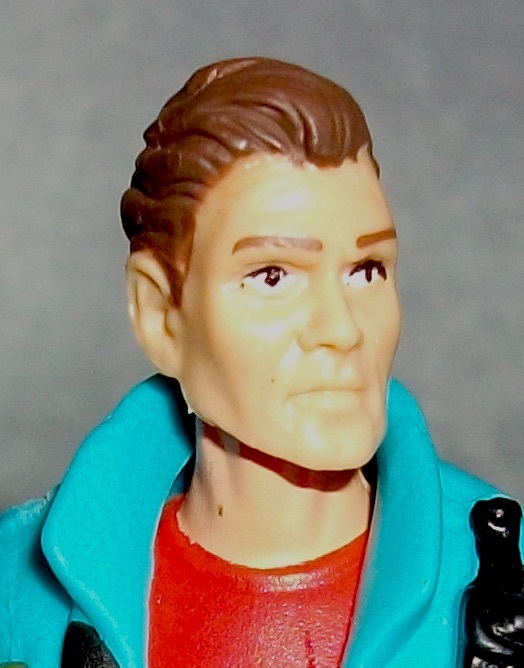 For example, I’m super stoked about this year’s Joe Con box set which is made up completely of 90s “Air Patrol” Joes. The 90s figures have been mostly ignored by Hasbro when it comes to their modern-era releases but the Collector’s Club has slowing been getting the job done via their box sets and subscription services. This year’s Air Patrol and 2014s Eco-Force box sets are prime examples. As for Ninja Force, Slice and Dice were both included in prior subscriptions and T’Jbang was shoehorned into the 2014 set. For that reason it wasn’t exactly a surprise to see Nunchuk included in this year’s FSS. He wasn’t a figure I was chomping at the bit to get but I’m always happy to add unique characters to my shelves. This figure is made up entirely of reused parts. He’s got a Storm Shadow torso and arms which gives him an appropriate ninja looking top half but then he has Barbecue legs which provide him with battle-ready combat boots. I like the combination; it’s a lot like what the Club did when they mixed Jinx and Scarlett parts to give us Vypra last year. 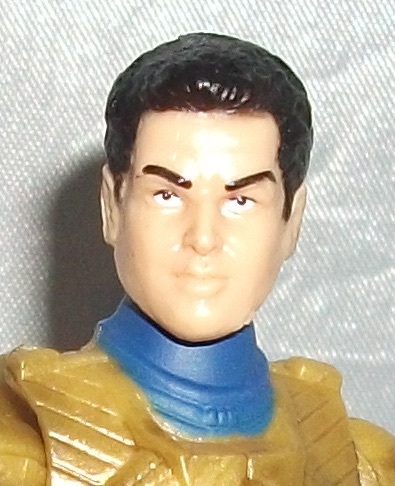 The head was also originally used for a Storm Shadow figure and it makes for a fine generic masked face. The removable helmet does an okay job of recreating the original figure’s hooded headgear but it’s not as good as it could be. I would’ve preferred to see the Club just glue some cloth to the head like on the original Nunchuk. At least the helmet is unique to my collection. 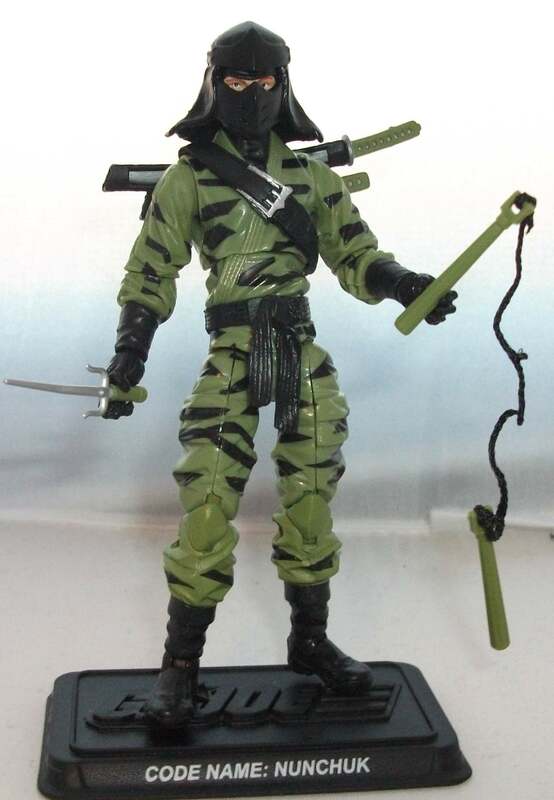 It original came with Snake Eyes version 55 which I don’t have. Nunchuk has lots of accessories we’ve seen before that range from really cool to completely useless. 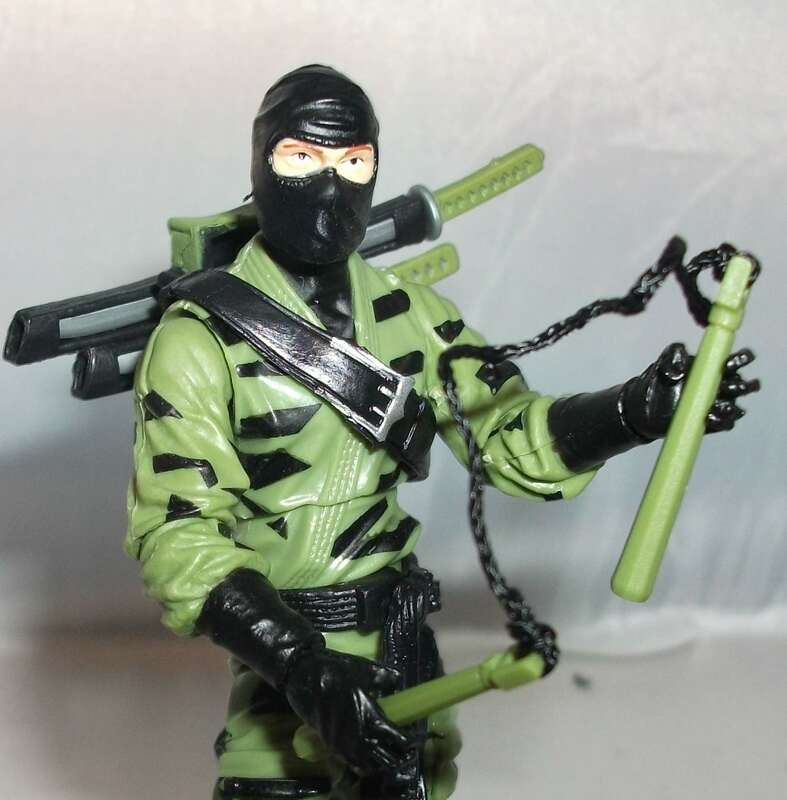 I love the nunchuks with the string connecting the two batons. It makes for a functional weapon that suits him perfectly given his name. The backpack, swords, and sais are good too but the teeny little darts are just asking to be lost in the carpet. The color palette is a bit dull but it matches the original quite well. For me personally, I expect this will be one of my least favourite figures from this year’s FSS and that’s a good thing because it’s not at all a bad figure. It’s a decent remake of the original with plenty of appropriate accessories and good articulation. What more could you ask for? My lukewarm reception is only due to the fact that I have no real connection to the character. 7 out of 10. As I sit down to write this “toy review” it is 2:00pm on March 10, 2016. It is important to note when I’m writing it. I just watched the new Captain America: Civil War trailer that hit the internet about an hour ago. More accurately I should say I just watched it multiple times. I get excited about every Marvel movie release but this one has got me bouncing in my seat. I feel like I’ve just been told I won the lottery and I want to run around telling everyone the good news but I’m presently at work in a quiet office where no one cares about this stuff. I emailed my brother Doug so we could gush about it but he hasn’t responded. I texted my brother Brian who had just watched it himself but we didn’t really get to talk about it because I’m not supposed to be on my phone at work and I think he’s lounging on a beach somewhere. My best pal Miguel and I have been emailing back and forth about it a little (he’s the one that told me it was up) and we both agree that we’re too excited to go back to our mundane duties for the rest of the afternoon. This is why I’ve opted to write this toy review instead but to be honest I’m not even sure what action figure I’ll be reviewing yet. I was just so excited to talk about the trailer I haven’t thought that far ahead. If you haven’t seen the trailer yet you should go watch it before continuing on because I’m going to spoil the big reveal. Ready? Spider-Man shows up at the end and he looks AMAZING! Spider-Man’s inclusion isn’t a surprise to fans in the know but I bet it will shock casual fans. It’s been public knowledge for months that Marvel Studios inked a deal with Sony to share the film rights to Spider-Man so that he could appear in their films starting with Civil War. What we didn’t know is how he would look. It had been said that Marvel didn’t want to give fans something they’d seen before and Sony pretty much nailed the classic red and blue Spidey costume in their last movie (that piece of crap Amazing Spider-Man 2). That led fans to believe we’d get something quite different in Civil War such as the black costume worn by the Miles Morales Spider-Man in the comics. 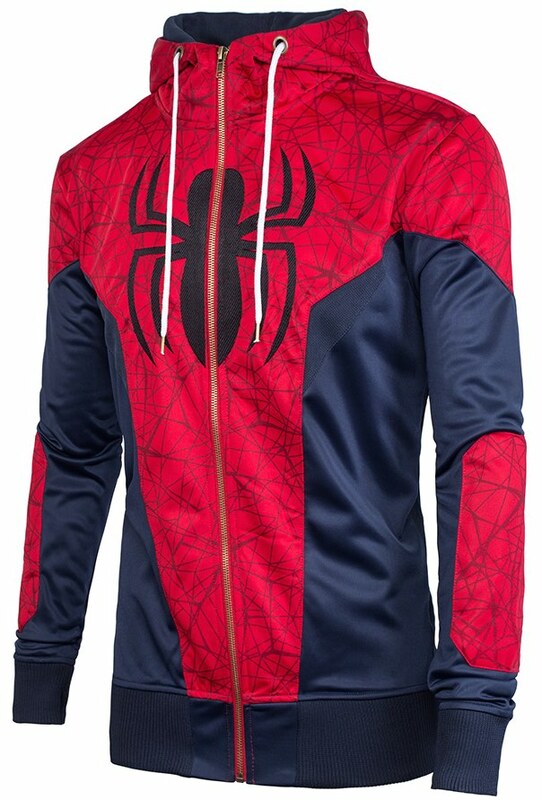 Images of a Civil War merchandising tie-in Spider-Man hoodie leaked out a couple months back which featured a scrambled web pattern on the classic outfit and many people logically assumed that maybe that’s what we’d see on screen. There has been a whole lot of speculation but that can now end. 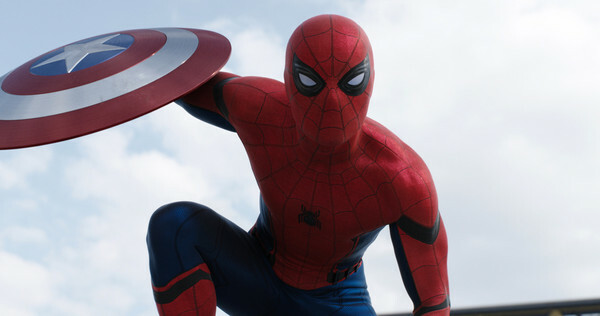 Marvel Studios has opted for a relatively classic looking red and blue costume with some minor adjustments. Tweaks aside, the shape of the eyes and the web pattern on the costume make it look to me like something John Romita Sr. might have drawn. It’s fantastic. The coolest thing about it was how the eyes squinted. It’s not realistic for a mask to move that way but the emoting mask has long existed in the comics and it worked for Deadpool on screen so I’m glad they went that route. It’s comic booky and it adds a fantastical and fun element to the character. I cannot wait to see more of him. I had just decided that I’d review a Spider-Man figure here (seemed appropriate) but that would defeat the purpose of the spoiler warning mid-paragraph. 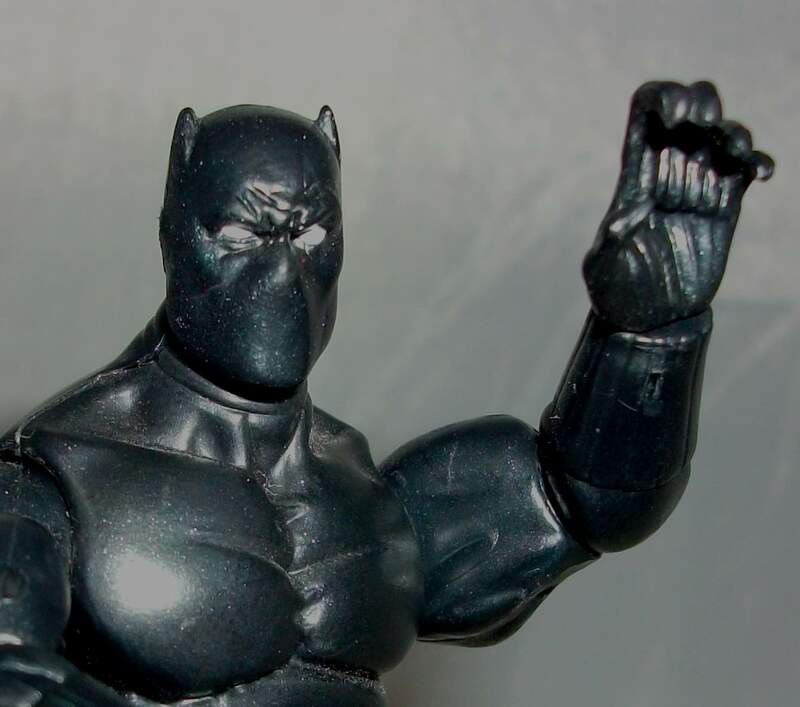 Instead I’ll review a figure of another character that gets to shine in the new trailer, the Black Panther. Black Panther is a longstanding hero of the Marvel Universe having first appeared in Fantastic Four issue 52 back in 1966. He’s had his own solo book many times over the years but none of them seem to last very long for some reason. I’ve collected his title in brief stints here and there but it’s usually the creative team (i.e. John Romita Jr. and Jason Aaron) that draws me in rather than a fondness for the character. I like the Black Panther, I just don’t love him. Perhaps it’s because he’s never been able to maintain a long running series that I find it difficult to get to attached to him. Anyway, he’s a cool character and a staple of big cross-over events. I’m very stoked to see more of him too. The Panther’s path to the silver screen has been a long one. As I recall, they tried to make a Black Panther movie in the 90s but red tape wouldn’t allow it so they made Blade instead. 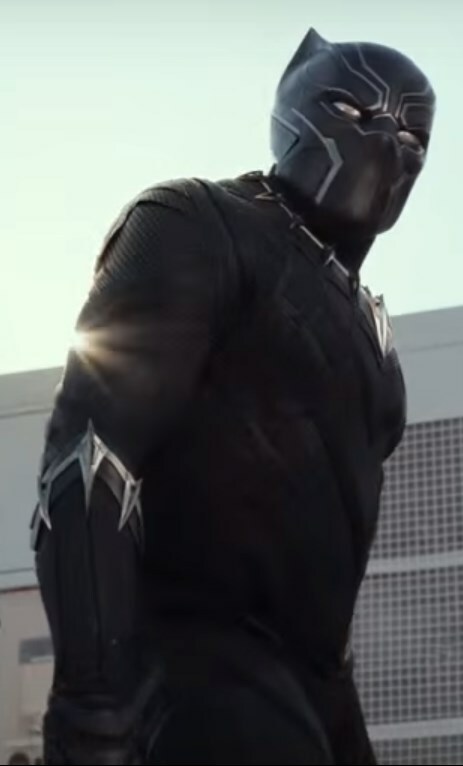 Well it took nearly another 20 years but Black Panther will finally make his live-action debut in Civil War this May. There were plenty of cool scenes with him in the trailer, ripping Bucky off of his motorcycle and whatnot, but he doesn’t have me nearly as excited as Spidey does. This figure is from the Marvel Universe line by Hasbro. It’s a good figure but it’s also a good example of why I hate paying $12 to $14 for these things. The sculpt is plain, (he’s just a dude in a full body leotard), there’s practically no paint apps to speak of (two dabs of white for his eyes), and he has one simple accessory (a redundant spear). All those things are appropriate for the character but Hasbro should give fans a break on the price considering how little work went into making this figure. The Civil War trailer gets a solid 10 out of 10. Even if the movie doesn’t meet expectations there’s no denying that this trailer is effective at getting fans pumped up and ready to spend their money. Batman v Superman could learn a thing or two. The figure gets a 7 out of 10. A couple of posts back I told you that I purchased a Marvel Legends Blizzard figure on a recent trip to my favorite comic shop, Strange Adventures. I neglected to mention that I also bought a War Machine figure that day. I didn’t mention it because I’m actually somewhat embarrassed by how much money I’ve wasted on Marvel Legends figures over the past couple of weeks. They sell for $24.99 a pop and in the past two weeks I’ve bought Scourge, Task Master, Scarlet Spider, Ghost Rider, Superior Venom, Cottonmouth, Blizzard, and finally War Machine. That’s a lot of dough. I vowed to settle down this week and not go toy shopping. Well yesterday morning I was working diligently on my files at work when I got a text from Dave, my pal and manager of Strange Adventures. He said that they had just received a shipment of toys but the boxes were all banged up so they’d be selling them at a discount. He recalled that I had purchased Blizzard and War Machine last week, both of whom came packaged with pieces of the wave’s build-a-figure, Hulkbuster Iron-Man. He said that shipment included a bunch of figures from that wave and he was giving me first stab at them so that I could complete my Hulkbuster. The shop is practically next door to my work so I popped right over. He had two boxes of Marvel Legends figures that he was selling for $10 each. The figures themselves were in perfect condition, only the boxes were banged up which means nothing to me because I open all my toys anyway. I ended up buying Vision, Black & Gold Iron Man, Valkyrie, and Thundra all of whom came with Hulkbuster pieces. Dave didn’t have a Doctor Strange figure though so I’m still one leg short of a complete Hulkbuster. I also bought Giant Man, Grim Reaper, and Tiger Shark from the build-a-figure Ultron wave. I could’ve bought Wasp, Ant-Man, and Bulldozer to complete Ultron but even I have my limits; seven figures was plenty. 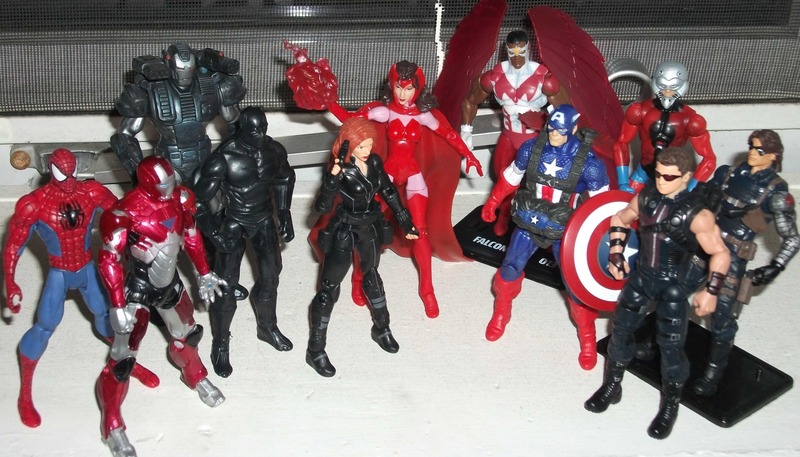 So that’s 15 Marvel Legends figures in 14 days. ouch. I never actually intended to complete the Hulkbuster figure but now that I’m only one leg away I have to seek out Doctor Strange so I can finish him. The Hulkbuster is a beast of a figure and it’s going to look awesome once fully assembled. You can see how big it is in the final pic of this post. For today’s review I’m gonna take a quick look at Thundra. I’ve been a huge Marvel nerd dating back to the mid-80s and I have a fondness for many obscure characters but I gotta tell ya that I have zero connection to Thundra. I know I’ve read a few books with her in them, some Hulk and old Fantastic Four, but she failed to make an impression on me. I sometimes get her confused with Titania, another Amazonian-like redhead that pals around with the Absorbing Man. Honestly I would’ve much preferred a Titania. Besides the fact that Thundra strikes me as a bland character I find her costume pretty boring too. Lackluster character aside, this toy is pretty average and forgettable as well. The face sculpt is okay but she has a weird expression and her eyes seem slightly too far apart. 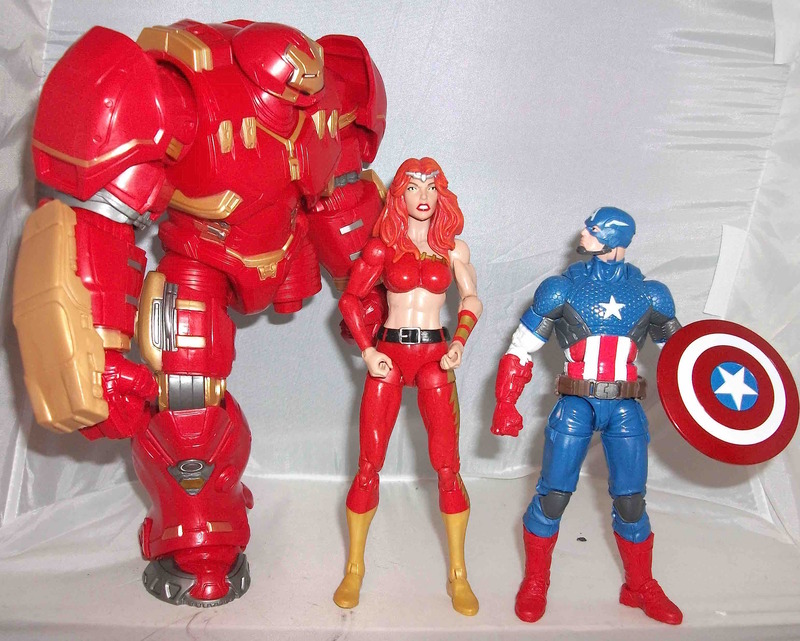 The body seems way too big even for an Amazon, she towers over Captain America and Iron Man. I don’t like how there are a few points where there’s no sculpting to distinguish the costume from her bare skin, like on her waist line and wrist guard. Lastly, the loose belt seems thrown on as an afterthought. I never would have bought this figure if not for the Hulkbuster part I needed. That’s why the build-a-figures are such a clever ploy by Hasbro. I would’ve considered adding a Thundra to my 3 3/4″ Marvel collection for $12 but for $25 this figure should be better than this. 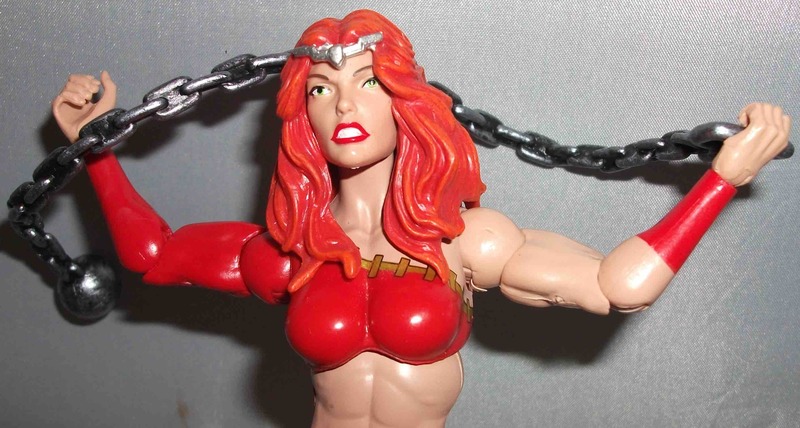 Thundra came with one accessory, a chain weapon. It’s nothing special but I guess she always has it with her in the comics so it’s good that Hasbro included it. I don’t know why they didn’t give this same chain to Ghost Rider. Oh well. 6 out of 10. Last Friday my first “G.I. Joe Collector’s Club: Figure Subscription Service 4.0” package arrived in the mail. For those of you not familiar, the Collector’s Club offers an annual subscription service where you pay a subscription fee above and beyond your standard membership payment in exchange for 12 exclusive G.I. Joe figures. The figures are shipped out in pairs over the course of six months. The 12 figures are all known to subscribers prior to signing up but a mystery 13th figure is included with the final shipment and nobody knows who it is until the package arrives in the mail. I can’t wait to find out who the mystery figure will be this year but that reveal is still 5 months away. For now, let’s take a look at Law & Order. I’ve opted into the FSS every year and have never been disappointed. Some figures are less exciting than others but overall there’s been a good assortment of characters every year. The line-up for FSS 4.0 was revealed at the 2015 Joe Con last spring and it looked to be another promising year. One figure I had mixed feelings about was Law and his dog Order. The original Law & Order were released in 1987. When we were kids, every time a new wave of Joe figures was released my brother Doug and I would each get one and then we’d rush home and determine who we’d buy next. Each wave featured approximately 20 figures and they were all showcased on the back of each figure’s blister card in a checklist style grid. We’d take turns picking one by one until every figure was assigned, even the crappy looking ones. I don’t recall specifically, but I’m betting that Law was either the first figure I bought that year or he was one of my first picks. 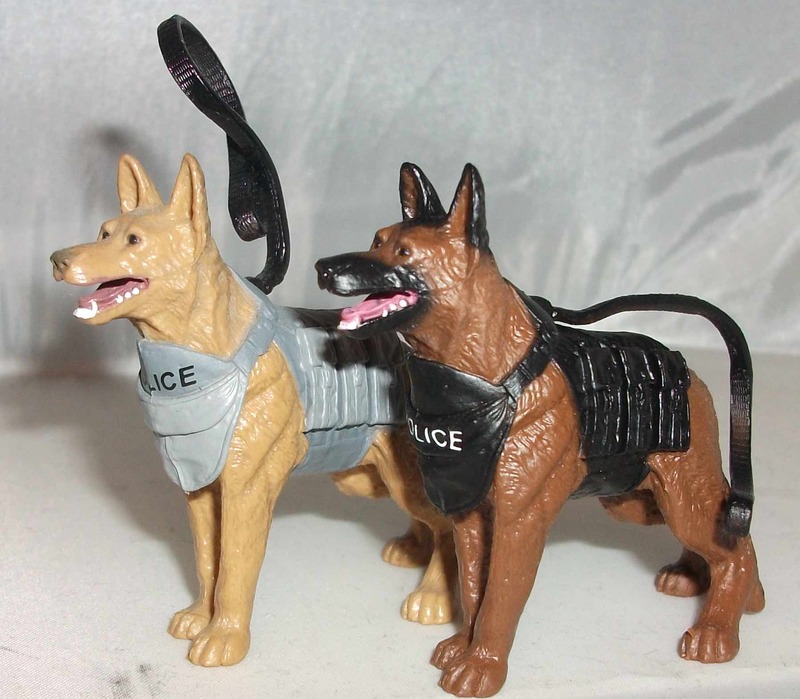 I was a sucker for any Joe that came packaged with an animal sidekick because it was like getting two figures for the price of one. The painted artwork on Law’s blister card made him look like a no-nonsense badass but the figure didn’t convey that very well. Law had a round face with a goofy smile and his hair was very flat; almost like he was sculpted to be a bald guy and then Hasbro slapped some painted hair on him as an afterthought. Law’s only appearance in the animated series was in the feature length ’87 movie in which he was portrayed as a bit of a dummy with a goofy accent. Despite these things I still really liked the figure. 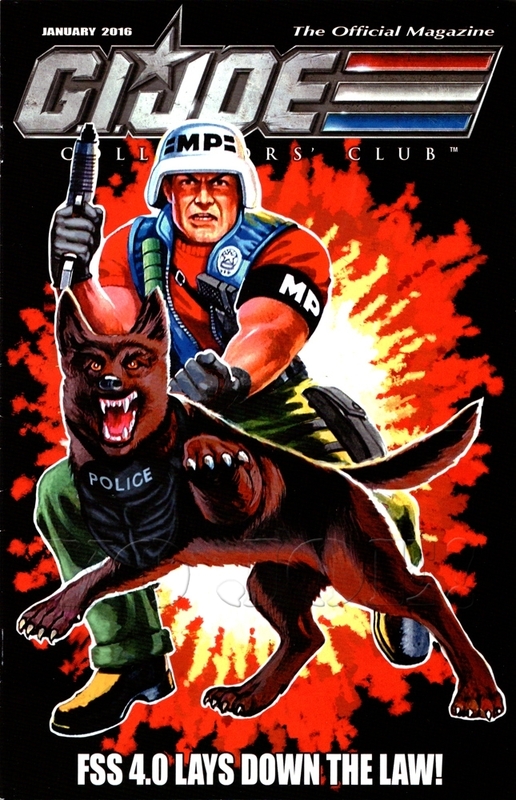 His primary specialty was unique (military police) his accessories were cool (white MP-branded helmet that covered his bad hair, a spiked collar and leash, an uzi, and a night stick) plus he came with a dog. Order was a single piece of plastic with no moving parts, as all Joe pets were, but his sculpt was great and he actually had paint apps. 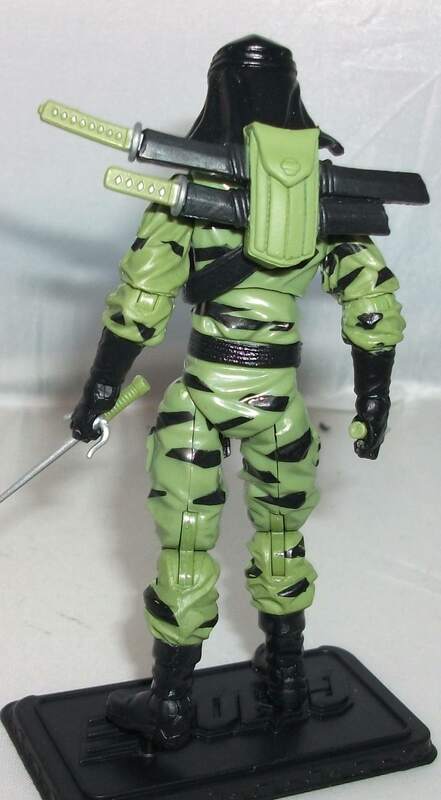 Neither Mutt’s dog Junkyard nor Snake Eyes’ wolf Timer had any paint apps so they looked very fake by comparison. Order had multiple black apps on his face, belly, and back which went a long way in adding to his realism. Law is a character I was really hoping would get updated in the modern-style during the 25th anniversary toyline of 2007 but it seemed like a long shot given his relative obscurity. It took some time but he actually ended up getting two modern-era figures, one in 2009 and one in 2011. Unfortunately neither one quite gave me what I was looking for. 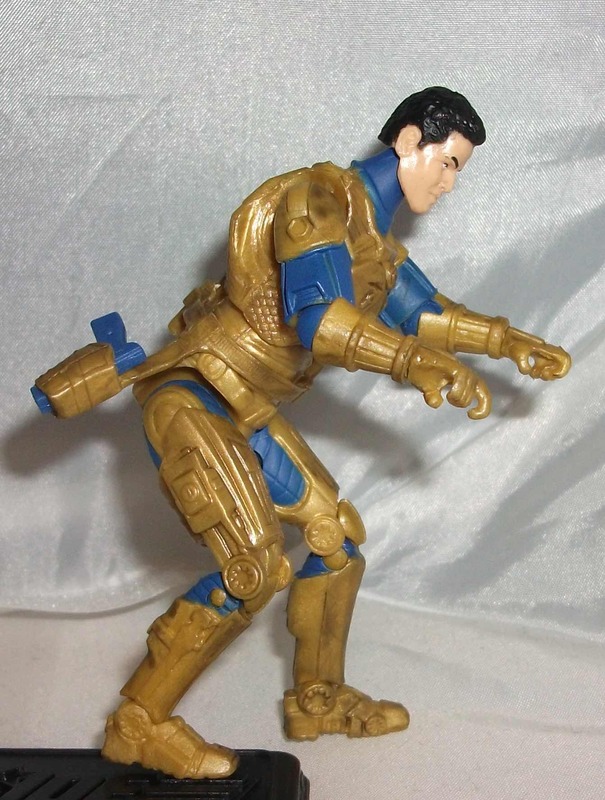 The 2009 figure was shoehorned into the Rise of Cobra toyline based on the live-action movie released that year. He was made completely of recycled parts including Dusty’s head. He came packaged with movie-inspired versions of Footloose, Dialtone, and Repeater in a Toys R Us exclusive multi-pack. None of them looked anything like their classic counterparts. All of them were wearing bland tan outfits and Hasbro even changed Repeater’s race and Dialtone’s gender. I saw the pack as a complete waste of money and ignored it. I came to regret that decision later when I decided that I did want the female Dailtone and discovered that the pack was selling for $100+ on the secondary market. I ended up buying Dialtone loose and never did get the other three. 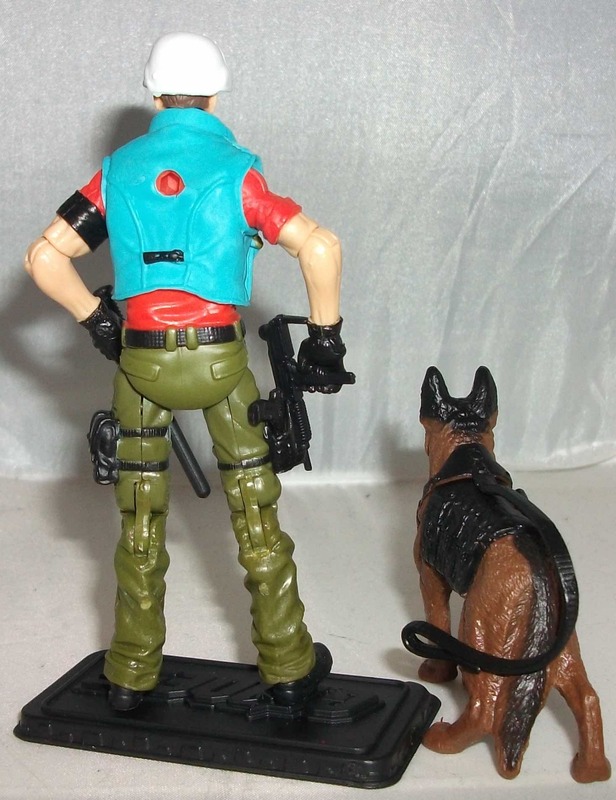 The second modern-era Law figure was based on the character’s appearance in the short-lived Renegades cartoon. It was a nice figure made up of mostly recycled parts but with a new head and arms. The head sculpt was far superior to the dorky round melon of the original. You could even go so far as to say that the 2011 Law was handsome in that action figure kind of way. He had a strong chin and a swept back wave in his hair. The only problem I had with that figure is that it was too “real-world”. The colors were very drab and militaristic. It looked like a believable real-life MP uniform which is cool but I would’ve preferred a more faithful adaptation of the original look. The Collector’s Club must’ve felt the same way because they included this classically attired Law in the 4th FSS. I think this figure is pretty great. It’s the best of 1987 and 2011 mashed together. The base figure is made up of the exact same parts as the Renegades version which is a great starting point. The major differences are the change in colours and webgear. Instead of the heavily padded bullet-proof navy blue vest of 2011 this Law has a more casual open vest in beautiful aqua. The pants and t-shirt have also been recoloured to match the vintage version. 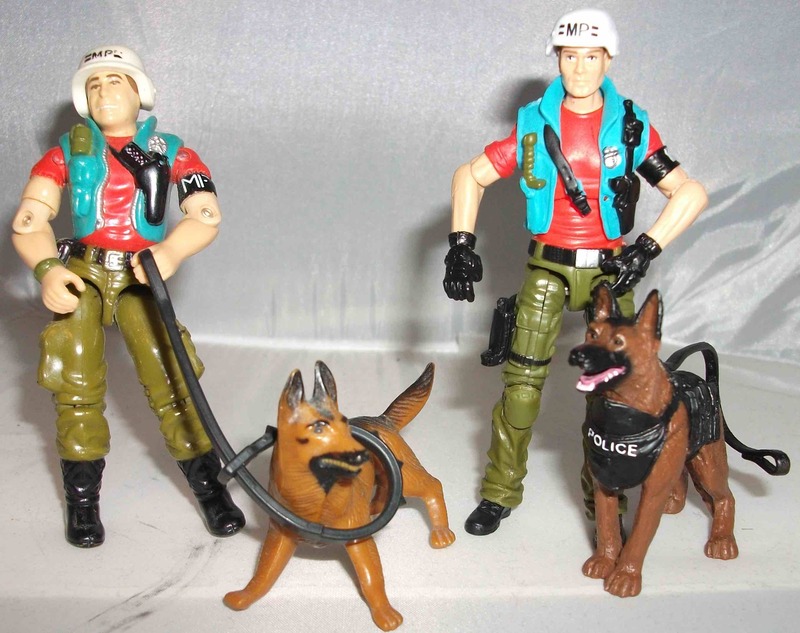 His accessories are also vintage accurate; helmet, uzi, nightstick, and dog with leash. Order looks fantastic. The sculpt is perfect including his doggy vest. He has an articulated neck so he can be posed a little bit and the paint apps are the best we’ve seen on a Joe pet yet. He’s got black ears, eyes, nose and tail, a pink tongue, white teeth, and “Police” written on his vest. its the same figure we got in 2011 but the colours are so much better this time around. My mixed feelings on this figure stemmed from the fact that these FSS figures are expensive and we already had a serviceable Law figure in our modern-era collection. I’d have been happy to purchase this figure at retail but at $40 a pop I would’ve rather seen this FSS slot go to a unique character. That was my initial reaction when the figure was first announced but as usual the Club has won me over. I’m quite happy with the figure now that I have him in hand. My only gripe, the arms don’t seem to rest at his sides and I don’t want to force them. 8 out of 10.